All transactions are safe and secure with a reliable history in online purchasing behind each of our associates. 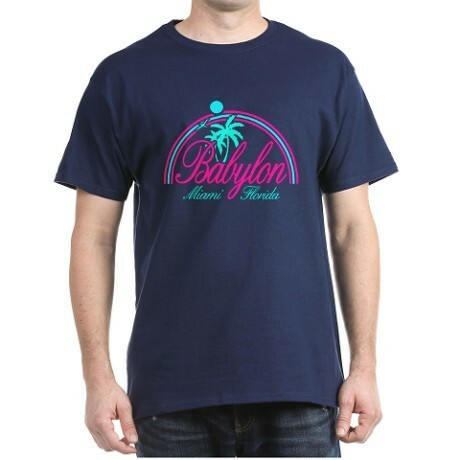 Buy the Babylon Club Scarface t-shirt to own Scarface clothing and merchandise. These dark Scarface t-shirts feature the Babylon Club logo for the establishment from the movie. It's where Tony Montana was nearly assassinated. Celebrate the fictional establishment with this stylish design. This piece of apparel will have you uttering Tony's Scarface movie quote, "Say goodnight to the bad guy," and other memorable lines. Add this item to your collection of Scarface merchandise. In addition to the Babylon Club Scarface tee above, browse the Scarface Clothing Gallery for more apparel like men's and women's clothes, kids shirts or hoodies.